Sassy Thinks It’s The Best Lip Balm…EV-AH! Pinterest and Etsy have become the hot media outlets where you can share your handmade products and recipes with the rest of the world. Seriously, what a fabulous idea. You post how you made that delish chocolate peanut butter banana mousse in a blender in less than 10 minutes and I’ll show you how to braid leather and glass into a couture bracelet in a day. (Please don’t ask me for the directions to either. I have no clue.) My personal DIY abilities are quite limited. I can FIX anything. I can even make the basic better. But to CREATE? I can take a top, pants, shoes, bag and accessories and CREATE an outfit. But that’s even pushing it. I have the utmost respect for those who can create. Designers, tattoo artists, builders. And if you can create something for fun that ends up being really good–like sellable good? Sweetheart, you’ve made your mark! A friend of mine, Doreene, has been raving to me about these lip balms that she got from Etsy for a while now. She knows my life revolves around fashion and beauty and said I HAD to try these best lip balms ever. I didn’t want to pop her bubble, but do you KNOW how many lip balms are on the retail market? Gazillions!! So, what made these special? But Doreen pressed on. I couldn’t let it go–Doreen said I HAD to try them! Okay, okay… I am a tester at heart, and an honest one at that. So you want to know what I think? Sit down and be ready because I WILL tell you. Let me give you a brief background of the products: “ForGoodnessGrape’s” (FGG) Philosophy is simple – This is the last stop on your quest for the BEST LIP BALM! As stated on their website, “products are made with high quality ingredients and hand blended in small batches resulting in fresh high quality beauty products. 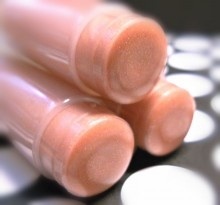 Each has a combination of at least 3-4 different highly moisturizing butters and 2-3 different superior skin softening oils.” As a victim myself of chronic chapped lips, and a strict studier of oils and butters, I knew already this company had a smart grip on what they were doing from just what I read. With a ton of questions and a lot of curiosity about the products, I figured I would touch base with Lisa, the contact person at ForGoodnessGrape.com. I explained to her who I was, what I did, and that I was told her fabulous products needed to be exposed which is where I came in. Lisa is a doll to work with if I have a question, she is right there with an immediate answer. I asked for a couple of samples of her best selling products which she sent me… quickly and over-abundantly! Lip Balms: FGG balms have just about every flavor imaginable. No, seriously. You usually don’t get moisturizing/healing ingredients in a flavor you like enough to use often to help your lips heal. Plus, all items are handmade to order. No stale products from shelves like many mass marketing names do. Your order was made with you in mind. They contain 3-4 different moisturizing butters and 2-3 skin softening oils to keep your lips soft and silky. Sassy’s suggestion? Buy at least 3-5, and put one everywhere! I have one in my purse, one in my makeup drawer, one in my car, one next to my bed and one I can throw in my pocket if I am on the run. If you want them all the same favor?…that’s up to you. But variety is the spice of life, so I have favorites like lemon cupcake (a must have), cake batter and kahlua and cream. Yum! Lip Tints & Shimmers: There are times when we want a hint of color with a lip product that keeps our lips soft and smooth at the same time. Lipsticks have a tendency to be drying, even after going on moist. That’s why FGG Lip Tints & Shimmers really caught my eye. I am so lost with lip products. Some are long-wearing but drying. Others tug and hurt my already chapped lips. Others are so focused on being “moisturizing”, that they slide off or transfer almost immediately. And this one company who had my hopes up with “baby” -feeling lips was unfortunately a fail when it came to lasting tints and softness. A lip tint–with enough “couture” color to stand out but the right formula to keep lips soft–was something that grabbed my interest right away. I was sent a sample of “Bitten” which was a soft, true red right out of the ‘old days’. “Mystery and Macabre” is a dark red tint that definitely wears more bold and dark than “Bitten”. I tend to use “Bitten” for daytime/casual wear, and “Mystery and Macabre” for evening events. I liked them so much I ordered four more in a variety of colors today. It’s also nice to know you can blend tints to come up with a shade just for you! 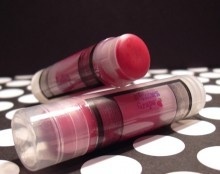 Hooray for FGG Lip Tints–two great products in one simple tube! 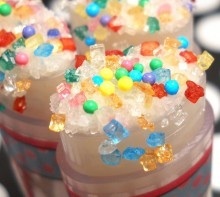 Sugary Lip Scrubs: Oh, people…. let me tell you this is the lip scrub to end all lip scrubs. 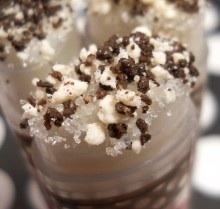 For years, I’ve been making my own lip scrubs, with exfoliating and healing ingredients. So when I saw that something that I myself had been making had been improved to store in a lip balm holder, in flavors I loved?… I was impressed. You could carry it with you as needed, as well be appealing to the eyes, nose and taste buds! (Yes, you can lick the excess off the tube!) Lisa sent me “Cherry Vanilla” and at first I was a little sad. I’m just not a big cherry-flavor fan. But it STILL was the first item I had to open and try because I had to see how it worked. And it DID! 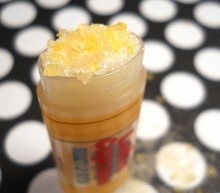 Not only do the various sugar grits rid the lips of dry skin, but its base is moisturizing and its flavor yummy!! I cannot WAIT to get more of these. Listen!—Sassy lesson coming here!–No matter WHAT you use on your lips for color or gloss (or especially if you use nothing,) you need a good lip exfoliant to use 1-2x a week! Nothing will ruin a great makeup look than blotchy, scratchie, ouchie lips. Scruff them off, then balm them up! FGG Lip Scrubs will be your new BFF. 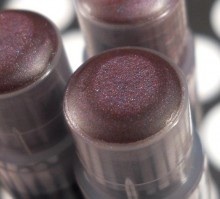 Okay, so if you can’t tell, I’ve found some of my new favorite lip products right here at ForGoodnessGrape. It’s nice to be discovering some of my new favorite beauty products coming from small local or home-based businesses. I won’t hesitate to pay a little more if I love what I get, it exceeds even my expectations, and helps us friends out here at home! 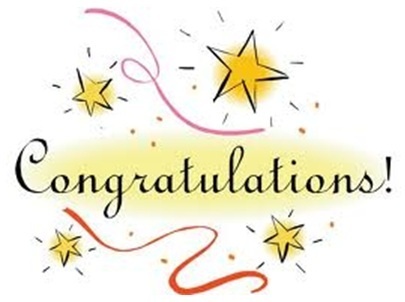 I am happy and proud that ForGoodnessGrape has made that list for me. 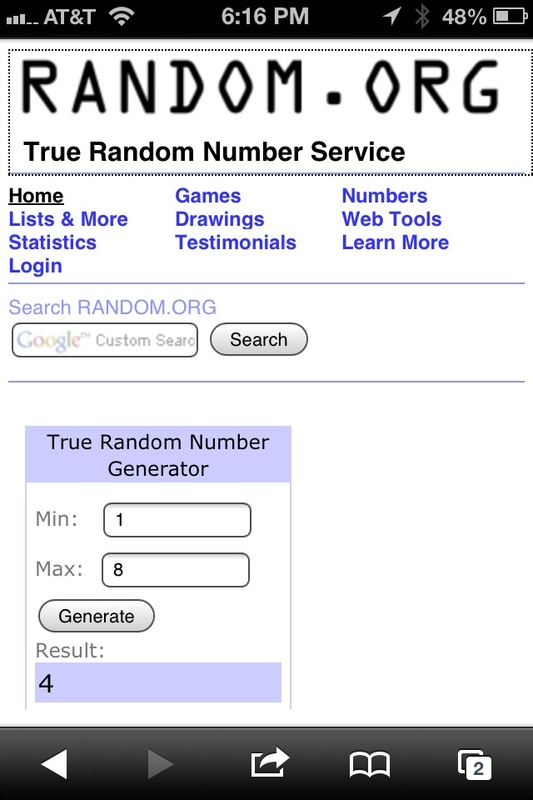 Welcome to my glamour-ama, Lisa! 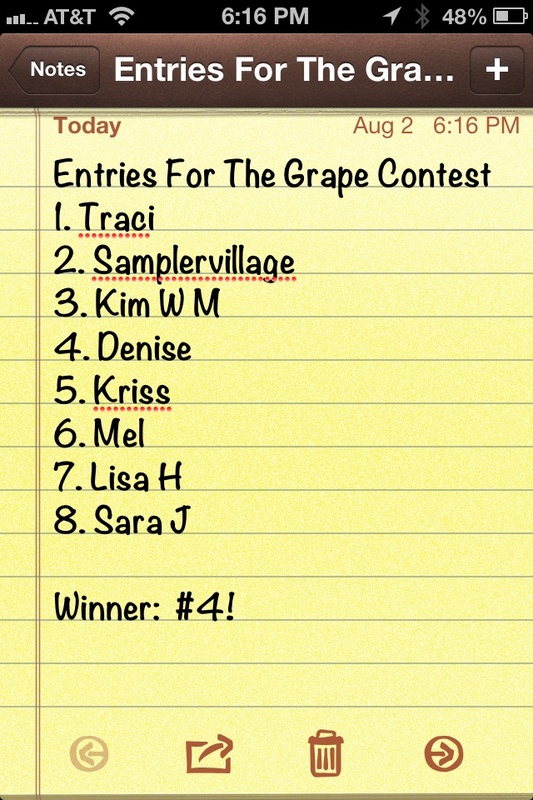 Don’t miss the opportunity to get the “Sassy Summer Sampler” from ForGoodnessGrape named just for ME! Just click the picture to go to this HOT deal!